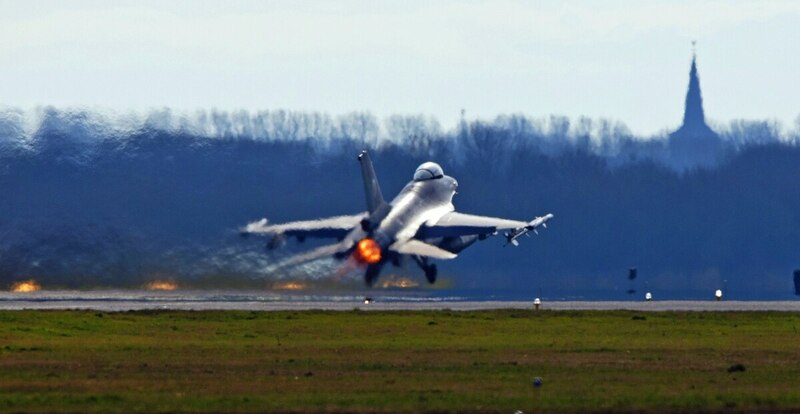 A Dutch F-16 fighter jet flying a training exercise over the Netherlands scored a direct hit — on itself — when the pilot fired the aircraft’s 20mm rotary cannon. The Royal Netherlands Air Force pilot was able to make an emergency landing at Leeuwarden Air Base after the plane suffered “considerable damage,” according to a report from Dutch state media. At least one round ripped through the jet’s exterior, the report said, while munition fragments were also found in the aircraft’s engine. “This is a serious incident," Wim Bagerbos, inspector general at the Netherlands Department of Defense, told Dutch media. U.S. aviators, of late, have dealt with a boon of aircraft mishaps, most notably incidents involving mid-air oxygen system failures resulting in a spike of reported physiological episodes. But a plane firing on itself, especially with its own autocannon, is almost unheard of — and impossible. At an altitude of 20,000 feet, Attridge entered into a dive while firing the Tiger’s 20mm rotary cannon. Continuing the dive all the way to 7,000 feet, Attridge exhausted the gun’s ammunition before the plane was hit by what he presumed to be a bird strike. Before long, however, the engine began to fail, and his emergency return to the Grumman airstrip was cut short as he crashed through a thicket of trees just short of the runway. Attridge would survive the crash, with numerous broken bones, and go on to work on the Apollo Lunar Module. The investigation into his crash found that the rounds he fired during the rapid descent experienced enough drag to drastically slow their velocity. As the plane’s acceleration increased, it managed to gain on its own rounds before miraculously connecting in mid-air. No definitive explanation for the Dutch F-16 mishap has been provided, but in any event, an American-made plane has made history once again.